The West Lake Cultural Landscape of Hangzhou is an implementation of the classical Chinese landscape ideal by improving the natural landscape with bridges, causeways, pavillions etc. The 'improved' landscape had a profound impact on the design of gardens not only in China but also further afield. I just read in the ICOMOS evaluation that this site sees an unbelievable 20 million visitors a year. This might make it the most visited WHS (not including major city centers). I visited it on a cloudy day in October 2007, as part of my Grand China Trip. I walked all around the lake, a trail of about 10km. And busy it was! For some parts it was as if I had joined some public hiking event. Lots of groups of schoolchildren, all dressed in similar training suits which are the Chinese version of school uniforms. The lake is very typical of Chinese landscape architecture - it all looks very familiar, you can see sights like this around all of East Asia. It's nice to do the walk, but the scenery is so very Chinese it is hard to get a feel for it as a westerner. Hangzhou is located in the east of China, not really my favourite part of the country. There's not a lot to see in this modern town besides the lake. I have been to West Lake several times, both before and after major clean-up and reconstruction. As one of the famous sites in China's history, it is incredibly crowded year round. Prior to the clean-up in around 2000, it was a dirty, filled with filth, as it was a culture relic of the "Old Civilization" which the Cultural Revolution was trying to get rid of, or at least, neglect. Since that time, they have build many hotels and entertainment facilities to choke it with tourists and chintz, including color-lit water displays. Wonder how such crass commercialism deserves a UNESCO WHS designation. This is an adapted review from my blog (Drafts from My Coffee Table), which can be accessed by clicking on my name above. Being a tourist spot most visited by locals and tourists alike, it wasn't easy to find a quiet spot in West Lake, but they do exist. There would be moments when a break appeared between the riot of crowds or a spot which was missed by the mass. It was at those times where I understood how this lake enthralled and inspired poets and artists of the past. The tranquility was unmistakable. Motorboats occasionally broke the peaceful scene with their thrumming engines, the surface of the lake rippling with waves. Some captains seeking passengers would approach anyone standing near one of the simple piers dotted around the lakeside, trying to get some business by ferrying passengers. I wonder what the ancient poets would write about such modern contraption barging noisily over the lake. West Lake in itself was charming, but with only the verdant as its colour palette would have been too monochromatic. Fortunately spring brought with it other hues to the scene - pink, the colour of cherry blossom. My exploration into the nook and cranny of the recreational area of West Lake brought me into the encounter with a group of men. And it was an extraordinary group of gentlemen in preparation of a celebration. Fortunately for my camera, their poses were set in stone literally - that is they were all statues. Read more from Sam Ang here. Jiang Nan, the name Chinese called for the Yangtze River Delta region, is the powerhouse of Chinese intellectual, art and economy since ancient time, and the main cities of Jiang Nan, Hangzhou and Suzhou, are well known for their beauty under the famous proverb "In heaven there is paradise, on earth Suzhou and Hangzhou". Hangzhou, the capital of Zhejiang Province, is celebrated by its landscape of West Lake or Xi Hu, the lake is decorated with arch bridges, zigzag pathways, causeways, mountaintop pagodas, lakeside pavilions, lotus ponds, carp pools, willow trees, bamboo gloves, etc., everything of classical Chinese landscape should be. 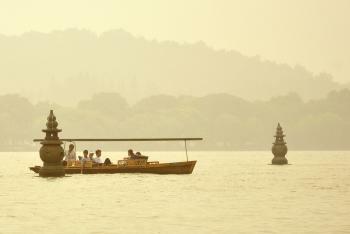 I visited the lake in summer 2011, the landscape was very beautiful liked Chinese painting; strolling around the lake and taking a boat to see the Small Yingzhou Island and its three small pagodas in the water were just relaxing and had many spots for good photo shooting while the misty cloud enchanted the beauty of the lake. 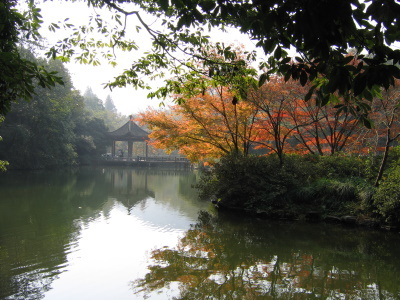 My favorite area is located in the southwest area of the lake, Hua-Gang Gardens and Xi-Li Lake, the small area but the landscape is truly outstanding with many gorgeous pavilions, bright orange carp ponds, wandering peacocks, fantastic green lawns, lovely forest and countless beautiful trees under the shadow of Leifeng Pagoda. In my humble opinion, West Lake is not an overrated tourist destination; the lake has major influence on landscape design in East Asia as gardeners want to duplicate or imitated the landscape element of the lake, as the result, similar landscapes can be found everywhere in China, or even within famous gardens in Japan and Korea, more similarity you see, more outstanding value of West Lake will be obvious, making West Lake to be another great World Heritage Site of China. Hangzhou is about two hours by fast train from Shanghai. The second time I visited the city was during the spring of 2009. A lot of tourists take part in bike tours, boat rides and the musical fountain show at night. Shops, restaurants and souvenir stalls are found around the lake area. The beauty of the site is manifested through the harmonious mix of man-made constructions (like arch-bridges, pagodas and temples) with the natural scenery of the lake and the surrounding hills. Brick architecture: Liuhe Pagoda is one of the best-preserved brick andwood pagodas extant in China. Originally built in 970 AD, the inner brick core is the result of a reconstruction in 1165. Marco Polo: Marco Polo apparently visited Hangzhou. He wrote about the lake too (see link). There is even a statue of him by the lake. Ibn Battuta: Ibn Battuta visited Hangzhou and must have seen the lake. Famous Love Stories: Lady White Snake and Xu Xian (story based in Hangzhou and the lake, met on Broken Bridge on the lake, Lady imprisoned under Leifeng Pagoda, etc). Poetic Quotations: Many, but here's a poem written by Bai Juyi in the Tang Dynasty. The lake in spring looks like a painting, the haphazard peaks surround the flat water. The pines stack on the peaks like multi-layered emeralds, the moon a pearl on the water. The padi like threads on a green carpet, the sweet flags like ribbons on a green dress. I cannot leave Hangzhou because of this lake. Former Largest Cities: Hangzhou had around a Million inhabitants between 1200 and 1400. 195 Community Members have visited.